Come and enjoy the Hôtel de Marle garden, a real oasis of calm. Used for occasional events, it also has a permanent collection of sculptures, from classical bronze statues to a very recent sound-piece. The garden is accessible to all during temporary exhibitions and events. See our events calendar for more details. 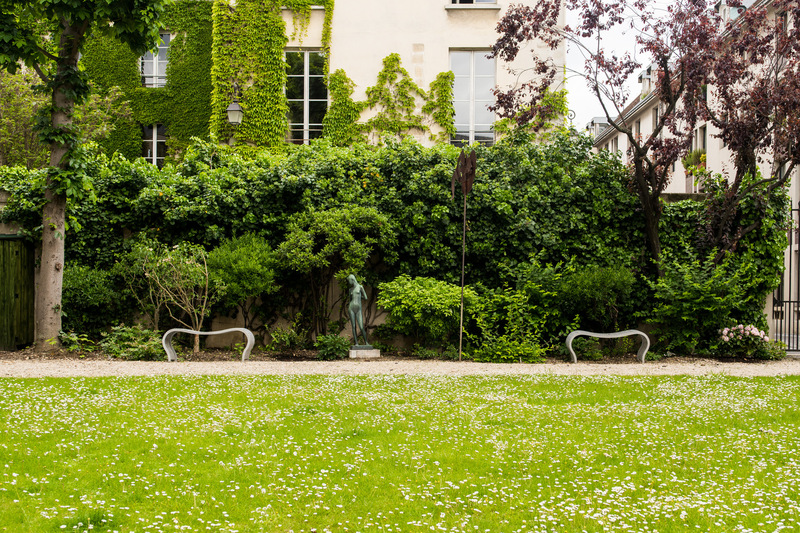 The 18th century botanist Carl Linnaeus, dubbed the « King of Flowers » by his contemporaries, calmly watches over the plants and artworks in the Institut Suédois garden: the bronze statue of Linnaeus is by the sculptor Carl Eldh. On the opposite wall sits an enigmatic self-portrait by Sivert Lindblom, like a contemporary Buddha. In the centre of the lawn, between these two bronzes from different periods, can be heard the gentle murmur of a sound work by Åsa Stjerna recalling the long history of the Hôtel de Marle. Amid the greenery and along the edge of the allees can be found other real or imaginary figures and creatures created by Swedish sculptors including Ellen Roosvall, Liss Eriksson, Gunnar Nilsson, Ansgar Elde, Harriet Löwenhielm Erik Grate and Bianca Maria Barmen. Some of these sculptures are part of the Institut Tessin collection established by Gunnar W. Lundberg in the 1930s with the intention of bringing together works by Swedish artists who have lived and worked in France and vice-versa. Other more recent sculptures were purchased by the Institut Suédois or the Public Art Agency Sweden, sometimes when the artists were exhibiting in Paris. This sound installation by Åsa Stjerna, made specially for the Institut Suédois in 2014, is based on the historical richness of the building. From the abandoned well in the garden come the names of people who have lived and worked here since the 16th century.